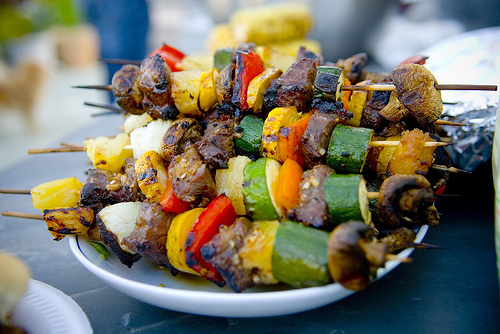 How do you host and enjoy those summer barbecues without gaining an ounce? Here are ten ideas for summer success. When making your own burgers, substitute lean ground turkey or chicken for ground beef when possible. If vegetarian burgers are on the menu, keep fat content low. Add egg white to your burger mix to add lean protein and keep seasonings in. Top burgers and proteins with fresh grilled vegetables and a heaping scoop of a fat free condiment such as sugar free ketchup, mustard, salsa or hummus. Try a themed flair when making your menu: a Mexican burger with taco seasoning, salsa, and avocado (side bar of toppings is fun for kids), or an Italian burger with fresh basil, low fat mozzarella and fresh tomato. Try whole grain rolls or flatbread as your burger bun (*best bet: serve on ½ a bun only). If serving/having a hot dog, go with turkey or chicken, nitrate free organic varieties. Choose salads that are mostly green. Stay away from your white salads (potato/pasta) which are mostly fat and carbs (mayonnaise and salad dressings can be loaded with unhealthy fats). Pasta salads are likely refined starch unless prepared with whole grain pasta. Have a light meal or snack before attending any outdoor festivities so that you are not tempted to over indulge on heavy foods and fatty snacks. Bring along whole grain crackers and low fat cheese to avoid the chip overload (who ever eats just one???). Enjoy fresh fruit that is in season to satisfy your sweet tooth. Top with Greek yogurt for a healthy, protein rich topper. Don’t forget to enjoy the active things we can do in this beautiful weather that New England brings in the summer, and most of all, your time with your family around the table with delicious, healthy foods!